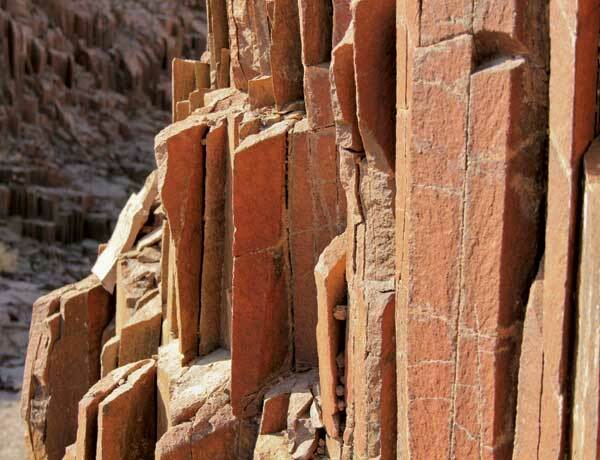 N amibia’s first World Heritage Site (status awarded in 2007), Twyfelfontein (meaning doubtful fountain), is a massive, open-air art gallery that is of great interest to international rock-art connoisseurs. The 2,000-plus rock engravings, estimated to be 6,000 years old, represent one of Africa’s largest and most noteworthy concentrations of rock art. It is believed by many that the creators of the rock art were the medicine people or shamans, who incised their engravings as a means of entering the supernatural world and recording the shaman’s experience among the spirits. The rock-engraving process could prepare the shaman for a state of trance by the repetitive chipping and concentration of energy. Etched into the rock are thus stories within stories, eternalised as our legacy of the past. Close by is the Petrified Forest, where a cataclysmic event millions of years ago deposited giant tree trunks that subsequently turned to stone. Today the Namib’s living fossil plant, Welwitschia mirabilis, grows among these prostrate fossilised trunks. 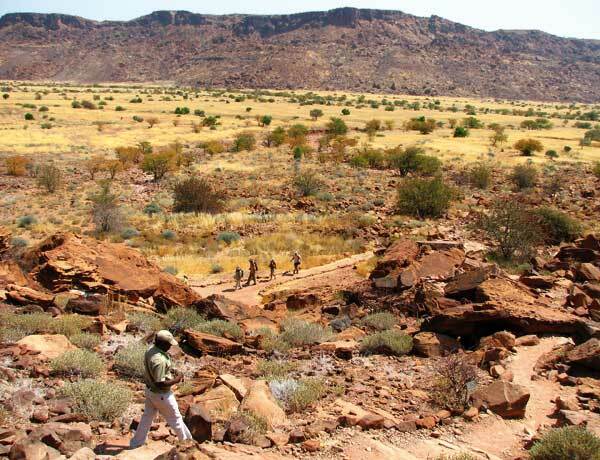 South of Twyfelfontein is the Burnt Mountain, a panorama of desolation with coloured rocks contrasting vividly against the grey-black surroundings. The Organ Pipes, a mass of basalt slabs in a ravine gouged out by a river, is another geological curiosity in the area. South-west of Twyfelfontein is Doros Crater, where fossil remains have been found among the rocks. a magnificent place to stay in the Twyfelfontein environs is Mowani Mountain Camp, situated between the Ugab and Huab rivers amongst gigantic boulders in an unspoilt wilderness of unsurpassed beauty. Also nestled among boulders and facing out onto superb scenery is Camp Kipwe. In the foothills of the Grootberg massif, set amidst the ancient Etendeka lava flows of northern Damaraland, you will find Etendeka Mountain Camp. Grootberg Lodge, perched on the rim of the Etendeka Plateau, is another great place to rest your soul.